Booth Fees are 10x10 for $50.00. This fee includes chairs and electricity where available and the Wrestling Team will be on hand to assist vendors with unloading your car and delivery to your booth space. Muffins and Coffee will be served to Vendors as they are setting up their booth. Applications are available here (along with booth layout) and are due by March 14th, 2014. For more information, visit their Highlights and Additional Information or contact their event coordinator, Staci, at LHSPTSA.craftshow@gmail.com / 972-897-6414. For more information, visit them on Facebook or contact their event coordinator at info.tvcm@gmail.com. "Unique, original, hand crafted, one of a kind! Architectural salvage, garden, repurposed, recycled, furniture, jewelry, handmade soaps, bath & kitchen goods, home décor, photography, art, jams and jellies. $2 admission donation to Young Life and free parking. Food vendors. 30 minutes west of Houston. 15 minutes from Katy. 5 minutes from Fulshear. You're already here from Simonton!" Outside areas available upon request. Covered arena, Stalls include electricity. Food trucks. Portable potties. Applications are available here and are due by March 1st, 2014. For more information, visit their website or contact their event coordinator at redpotatomarket@att.net / 281-533-9863. "Join us for a weekend of fun, exercise, and family entertainment at the World's Only Best Maid Pickle Parade & Palooza! You'll find fun and entertainment for the entire family! 10k, 5k and 1-mile runs kick off the day, followed by the World's Only Best Maid St. Paddy's Pickle Parade! After the parade, enjoy the vendors, food and bands, including headliner Le Freak, World's Greatest Disco Band!" Main Street at the corner of Main and Broad. Booths are 10 X 10 and cost $35 plus $15 for electricity if requested. Discounts available for double booths. They are looking for handcrafters only - all reseller spots are filled. Volunteers will be available to help set up/break down and be at your beck and call throughout the day. Applications are available here and are due by March 8th, 2014. For more information, visit their website or contact their event coordinator at pamclothey@gmail.com. Reserved spaces include beverages, snacks, and a goody bag. Applications are available here and are due by April 9th, 2014. For more information, visit their website or contact their event coordinator at girlmakesgoods@gmail.com / 972.839.4225. 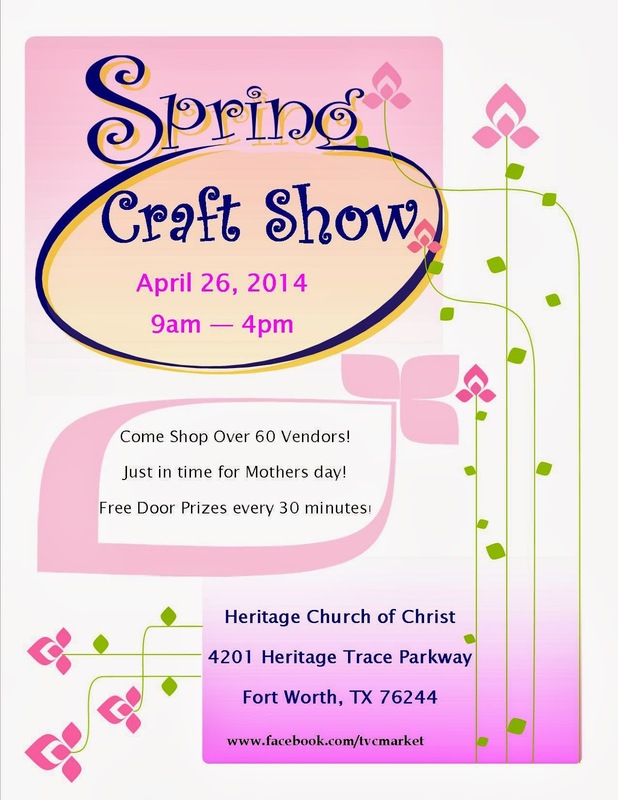 "Martin United Methodist Church in Bedford, Texas is hosting a Craft Fair, March 29, 2014 from 9:00 - 4:00. We would love to invite you to join us for a day of fun, fellowship, and hopefully lots of visitors to shop!" 6 x 8 Inside space: $65.00 or $100 for 2 booths. Limited amount of electricity spaces available, first come first serve basis. 6 x 8 Outside space: $50.00. No electricity or shade spaces outside. Rain contingency plan available. Applications are available here and are due by March 15th, 2014. For more information, view their Rules and Regulations or contact their event coordinator at journeymumc4@gmail.com / Phone: 817-685-0713 ask for Teresa, Craft Fair Coordinator. "It's time for the 2nd Annual Lake Worth High School Spring Fling Craft Fair! We are looking forward to another successful year as shoppers get a head start on Mother's Day shopping. We will feature such popular items as custom jewelry, home decor, boutique clothing, candles, and handmade items. We are thrilled to directly support the LWHS CTE Department. We greatly appreciate your support and look forward to seeing you soon!" Limited number of booths will have access to electricity which is an additional $10.00 and the vendor must supply all electrical cords. Applications are available here and are due by April 20, 2014. For more information, visit their Booth Map, Rules and Regulations, or contact their event coordinator at lmenton@lwisd.org, Roni at rsadler@lwisd.org, or call 817-306-4200 ext. 3055 or ext. 3414. Tables are $10 and electricity is $5. Applications are available here and are due by March 4th 2014. For more information, visit their website or contact their event coordinator, Cheryl, at fcpbazaar@faithbridgechurch.org / (972) 377-9560. Main Area / Fellowship Hall is full. Applications are available here and are due by April 25th, 2014. For more information, visit their website or contact their event coordinator at Rwgodwin68@gmail.com / 214-356-5508. 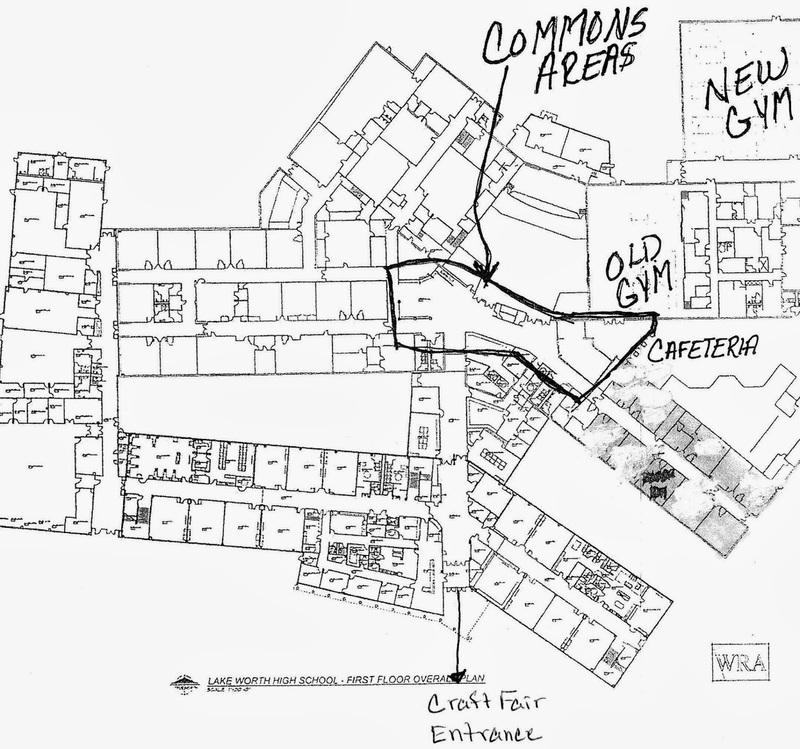 Main Area (Gym) – Booth Area - Approx 8x8 @ $40.00 (EHBC church member $35). All Vendors Must furnish your own table. Tables will be provided if needed for $5.00 each table. Tables are not included unless requested. Electricity will be provided vendor must bring own extension cord. There will be a cafe open. Applications are available here and are due by July 1st, 2014. For more information, visit their website or contact their event coordinator, Dana, at ehbcsecretary@yahoo.com / 972-240-2946. "The 10th Annual Carnival & Craft show at Martha Reid Elem., in South Arlington/Mansfield, will be the perfect place to shop. Parents can shop while the kiddos play! We have large and small booths avail indoors. In the Cafeteria, we will be having performances of choirs, dance troops, karate, and more throughout the day. Weather permitting, the carnival events will be outside. We are excited to have a huge variety of vendors from around the DFW Metroplex! There will also be a silent auction and a raffle. Event is April 12th from 10am-3pm"
Coming from South 360, take the Ragland exit to the Right and turn left at the Collins Stop light and you will see the school. Nearest Cross street is Country Club Dr & Matlock or Country Club Dr & Collins. Carnival tickets will be avail for purchase in the school for the children to play the games and bounce in the bounce houses. Applications are available here and are due by March 21st, 2014. For more information, contact their event coordinator, Erica, at ebevanstx@sbcglobal.net. Work from home in the exciting and creative industry of outdoor art markets! Pop-Up Market is a fun event held at convenient locations throughout Tarrant County, and can be setup virtually anywhere. Artists bring their own setups. There’s no bricks and mortar location, and no employees! You can set your own hours and work as little or as much as you want. The owners spent more than 12 months researching, contacting vendors and strategic partners, developing layouts in order to get Pop-Up Market started. The hard work is done! Contact the current owners today at popupmarketinfo@gmail.com to find out more! "Kick start your spring shopping, pick up your Mother’s Day gifts or indulge yourself with a trinket or two at the 1st Annual Mesquite Artisan Faire “Sip and Shop” benefitting Leadership Mesquite. Spend a wonderful afternoon shopping, supporting local businesses and the 2015 Leadership Mesquite Scholarship fund. Vendors include local retailers and independent merchandisers selling unique and wonderful items." Booths are a 18" X 72" seminar table and 1 chair for $120. Electricity is limited and available for an extra $15. For more information, visit their website or contact their event coordinator at cflores@gmail.com / cflores@cityofmesquite.com / Crivasflores@gmail.com / 972-216-8132 (8AM - 5PM). "Rhea Lana's is a semi-annual community consignment event, one week in the spring and one week in the fall, of high quality children's clothes, shoes, toys, books, DVD's, baby items, like-new maternity clothes and much more! It is our mission to serve with love and integrity, families everywhere with inviting, excellent and valuable children's consignment events. We can't wait for you to experience the difference this consignment event offers. We would love to have you join us as a shopper, consignor, volunteer worker or better yet, all three! Rhea Lana's supports the community through mutually beneficial marketing opportunities with local business.Serving and connecting families is what we do best. If you have questions about our event, contact me. I am excited to see you soon!" SE Corner of I-35 and Hebron Pkwy. Booths are 10 X 10 and cost $60 for three days. Vendor is responsible for their own table and chairs. For more information, view their Sponsorship Options, their Vendor Agreement, visit their website, or contact their event coordinator at tiffanya@rhealana.com / 972.824.7624. "Demonstrations of various fiber craft techniques by local artisans." "Admission-free family event featuring groups from the entire school community. We will have food trucks, live entertainment, drinks, shopping, games, music and much more! Bring the entire family and enjoy our 4th annual community street fair!" For more information, visit their website or contact their event coordinator at StreetFair@wtwcommunity.org or contact Serena Cole at 214.566.1595 /duxiana@aol.com. "GOOD FAMILY FUN! There will be concessions, bounce houses for the kids, face painting, CRAFT FAIR VENDORS and CHOIR SHOWCASE. Great Easter and Mother’s Day Gifts." Applications are available here and are due by February 28th, 2014. For more information, contact their event coordinator at djdavis@garlandisd.net. "We will have over 50 vendors for your shopping pleasure. Anything from your favorite direct sales companies to the always wonderful handmade items. We will have concessions open for your convience. So bring the family and sprand the day with us!" Electricity and tables are available for $5.00 each. Booths are a 6ft table for $65 (reduced to $50). Table not included. Electricity is available for an additional $10. For more information, contact their event coordinator at bethanythornton81@yahoo.com. "We have over 60 vendors from a variety of Handmade Items and your favorite Direct Sales Vendors along with several Food Vendors lined up. We also will have a bounce house for the kiddos to enjoy, face painting to brighten any kiddo's day up, a photo booth to share memories, a silent auction from products from each of our vendors, luminaires to donate and we will be doing Dimes For Donations because silver can help make a change in finding a cure! So make sure to mark your calendars and bring the whole family to enjoy a day of shopping, yummy food and lots of fun for everyone for an amazing cause!" Booths are 8X8 and cost $35. Electricity is $5.00. Vendors are asked to provide a raffle item for the raffle. 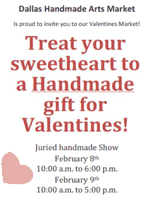 Handmade items are specifically requested to fill the rest of this venue. For more information, contact their event coordinator at creatingforacause@live.com.